Because we’re just too afraid to be wildflowers? Still afraid to become wildflowers? I’m sure such a thing exists. How else can I explain what I’ve been going through this past year? Everything that I thought was important, suddenly appears not to be so. A definite and clear shift in my values and even some of my personal qualities has taken place. Yet I sit here facing the sea and have no more tears to cry, no more “whys” to demand from life. Today, the vendor who rents beach chairs decided that he would help me get a cab from the beach by all costs. He stood attently looking at both sides of the street and calling the attention of every cab that passed by, until he finally got me one. I had already paid him for my chair and stool for the day and I never asked for his help hailing a cab. Still, once he put his mind to help me, there was no stopping him. He did it willingly, with pride even to be able to help me. Have I just been complicating my life? Pushing aside the things I love for grandiose ideas of what my life should really look like? It’s not about what we’re doing with our lives; It’s about what we do when our life isn’t going the way we’d hope it would. All these men have taught me this lesson these past few days. Now when I sit in front of the ocean thinking about the mess I’ve made of my life, instead of asking WHY, I’m asking HOW. How can I begin to be happy again? 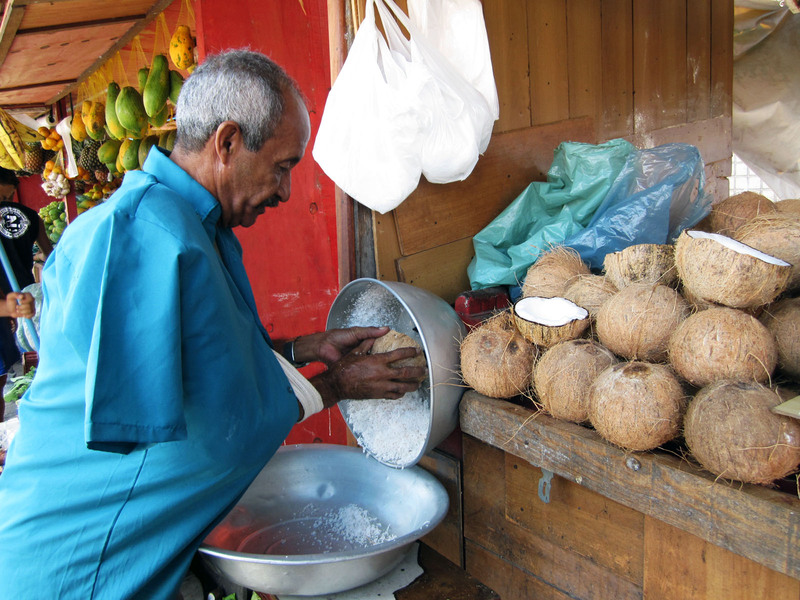 The man who shreds fresh coconut flesh in the street market of the Jatiúca neighborhood smiles at me when I approach his stand. He has one hand on a coconut. The other arm is held by a sling under his buttoned-up blue shirt and his hand peeps through the space between two buttons. As I approach the shredder, he shows me his pride: a machine made of two iron bowls, the top complete with a shredding tool. Filled with pity I try to conceal, I ask him how long he has been shredding coconuts. He tells me, with a smile on his face, that he’s been shredding cococunts for three years, two withthe help of the shredder. I’m confused by his happiness, although I’ve seen it in the face of other street market workers and homeless for so many years that it really shouldn’t surprise me anymore. I continue speaking with the man, asking him how he found his shredder and if it has helped him do his job. I half-expect him to sigh back, to share with me how hard his life is, shredding coconuts under the hot sun for middle class and rich folks. But he never does. Under the burning sun of mid day, he continues to smile, and tells me he is so grateful to God, who has been so kind to him. I stop feeeling pitiful for him and start feeling pity for myself. Here is a man who knows how to be happy with so little, a man who is an example to everyone. I want to hug the man, to tell him he’s an inspiration. I want to buy all his coconuts and make him wealthy somehow… Then I realize that he has much more than any money I could ever give him. I take a picture of him so I never forget that I too, should be as happy and grateful as this man, if not a thousand times more. Not because I am any better than him, but because life has been kind, because I still have both my arms, and because I don’t have to stand under the hot sun, shredding three coconuts for 2.50 reais. As the end of the year approaches, I hope you take the time to reflect on all the wonderful things and people in your life. I hope you also take the time to give back to those who may not be as fortunate, either financially or in kind words. But above all, I hope that in 2012, you never become too proud to walk around and learn lessons from the man who shreds your coconuts.